This is "Dialogs" page in EurekaLog project's options. This page contains one combo-box to select dialog type in your application. The rest of the area is changed depending on your dialog's choice. 1. "Test" button allows you to test current settings. Click on this button to view how error dialog will be displayed in your application at run-time. You can use this button to quick-preview/test settings without need to close options dialog, compile your application, etc. Note: actual exact behavior and visual aspect of dialog may be different in run-time because of your event-handlers or run-time environment. For example, you may see "Send report" button in preview, but not at run-time - because you raise duplicate exception at run-time and sending duplicates is disabled. 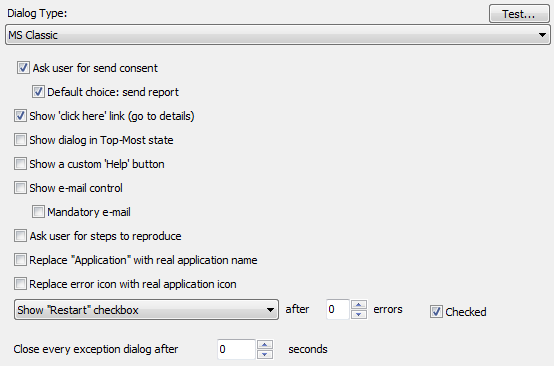 Important note: EurekaLog will automatically include code for the selected dialog into your application. However, code for other dialogs will not be included. This is important if you're going to change dialog type at run-time (via custom code, event handlers, custom attributes, or exception filters). You should manually add code for each dialog that you want to use at run-time.